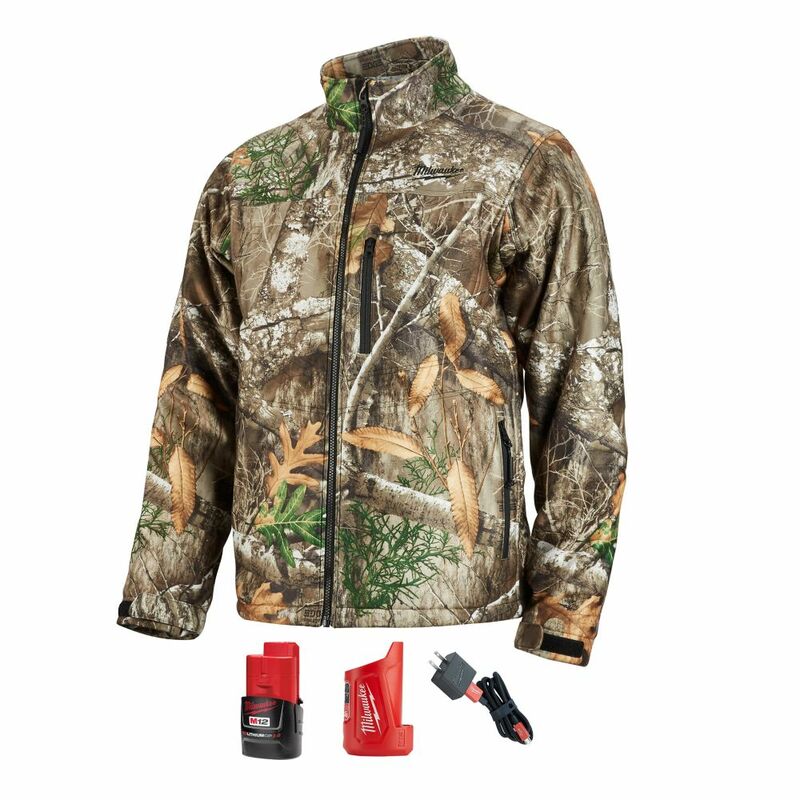 The extra large Realtree camo heated QUIETSHELL jacket kit is powered by the M12 REDLITHIUM battery. Each heated jacket uses carbon fiber heating elements to create and distribute heat to the chest, back and front hand pockets. A single touch LED controller heats up the battery heated jacket to three heat settings. The MILWAUKEE heated jacket kit's Quick-Heat funtion heats up three times faster than previous jackets and market competitors. The heated hunting jacket also features Realtree Edge camo pattern. The QUIETSHELL stretch polyester material reduces noise from movement and provides wind and water resistance. This kit comes with one heated jacket, an M12 battery and compact charger and power source. The DEWALT DCHJ062C1-XLC XL Battery powered heated jacket can provide hours of core body warmth and continuous heat. This jacket features 4 Core heating zones; upper left and right chest, mid-back, and collar. The entire line of DEWALT 12-Volt Max and 20-Volt Max batteries can be used with this jacket. A DEWALT 1 Year Limited Warranty is included for added peace of mind. Men's X-Large M12 12-Volt Lithium-Ion Cordless Realtree Camo Heated Jacket w/ (1) 2.0Ah Battery The extra large Realtree camo heated QUIETSHELL jacket kit is powered by the M12 REDLITHIUM battery. Each heated jacket uses carbon fiber heating elements to create and distribute heat to the chest, back and front hand pockets. A single touch LED controller heats up the battery heated jacket to three heat settings. The MILWAUKEE heated jacket kit's Quick-Heat funtion heats up three times faster than previous jackets and market competitors. The heated hunting jacket also features Realtree Edge camo pattern. The QUIETSHELL stretch polyester material reduces noise from movement and provides wind and water resistance. This kit comes with one heated jacket, an M12 battery and compact charger and power source. Men's X-Large M12 12-Volt Lithium-Ion Cordless Realtree Camo Heated Jacket w/ (1) 2.0Ah Battery is rated 4.2 out of 5 by 15. Rated 5 out of 5 by Hunter from Great Quality Bought as a gift. Well received. Highly recommend. Rated 5 out of 5 by Juviejack from Excellent jacket, very warm. Great fit, true to size.... Excellent jacket, very warm. Great fit, true to size. Rated 5 out of 5 by Allen from True to size and VERY warm. Perfect for people working... True to size and VERY warm. Perfect for people working out doors in the winter. Rated 4 out of 5 by So from Nice coat. 38 and raining today. Coat kept me warm and dry. Set heat to medium and got too war... Nice coat. 38 and raining today. Coat kept me warm and dry. Set heat to medium and got too warm. Went to the low setting. I do wish it had a hood. Rain was running down the back of my neck. Rated 5 out of 5 by Murcat7 from My husband loves it. We got it for hunting... My husband loves it. We got it for hunting but he's been wearing it all over. He really likes the warmth when hunting.